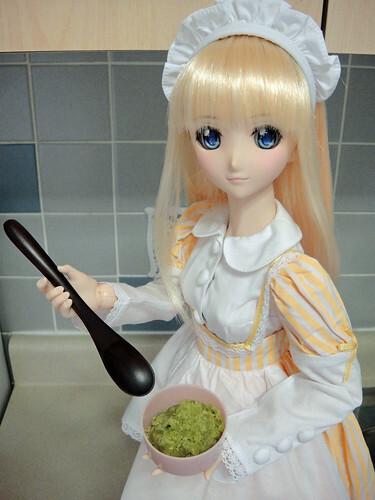 Here’s Airy combining the ingredients – she’s mixing together flour, matcha tea powder and pinch of salt. Next form the dough into a log and lay it on some cling film. When the dough is nice and chilled, take it out of the freezer and slice it into 1/4″ pieces. The dough will be quite firm so you’ll need a good knife, and since Airy’s not allowed to handle sharp knives, I did this part for her. Then lay the cookies out onto a baking tray. The cookies won’t expand too much so you don’t have to worry about them being to squished on the tray. If you’re in the mood you can roll out the chilled dough and cut out shapes with a cookie cutter. 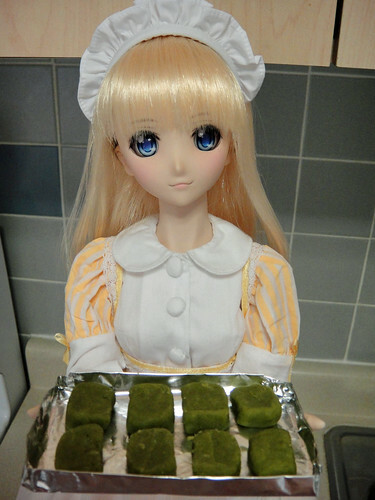 Bake the cookies in the oven for 16-18 minutes at 325° F – keep an eye on them so they don’t brown too much and lose the characteristic green colour! When they are done, let them cool for a few minutes before serving. 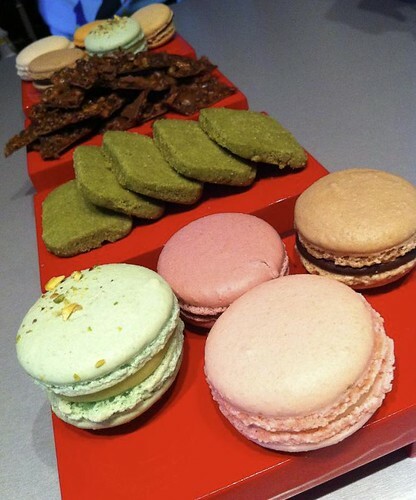 This is what they look like when they’re baked – yum! 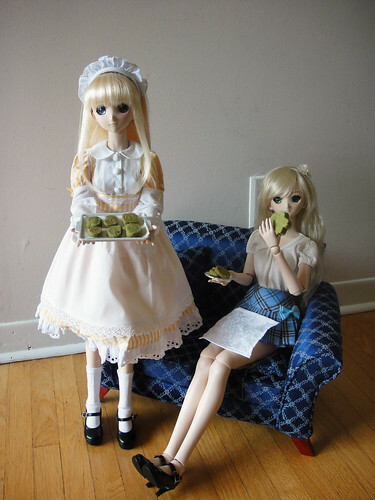 Airy’s not used to making such little cookies so they baked for a little too long (which is why they are brown) – but they sure are tasty! Let’s share some with Saber Lily and see if she likes them. おいしい! 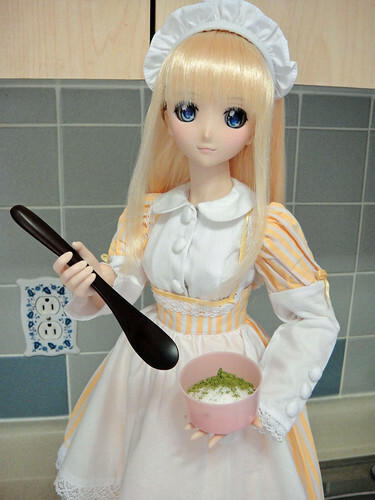 Saber Lily definitely approves of Airy’s baking skills. 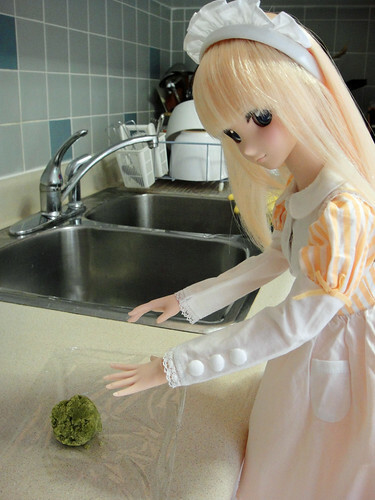 Sift the flour, powdered tea and salt into a bowl. In another bowl, beat butter and powdered sugar until fluffy. Add flour mixture to butter mixture and mix slowly until dough just comes together. The dough with be dry and crumbly. Pull dough together carefully in a log, approx. 3 inches in diameter. Wrap dough log in cling film and place in freezer for 30 minutes until dough is firm to the touch. Slice dough into 1/4 inch rounds and place on a parchment paper lined cookie sheet, approx. 1 inch apart. Bake in a preheated 325° F oven for 16 to 18 minutes. Remove cookies immediately from the cookie sheet and allow to cool. Store in an airtight container or wrap well and freeze. 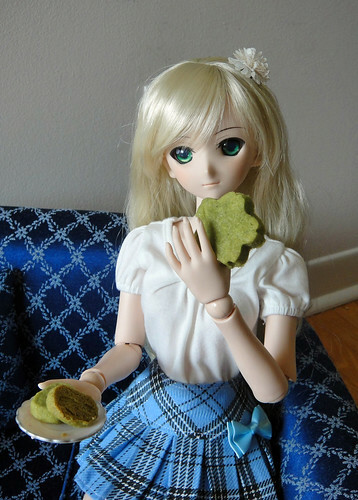 These cookies look very distinctive when served because of their bright green colour. I hope you try this simple recipe out! 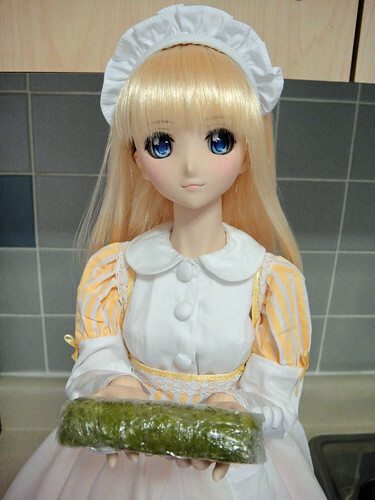 This entry was posted in Dollfie Dream and tagged Airy, Dollfie Dream by archangeli. Bookmark the permalink. 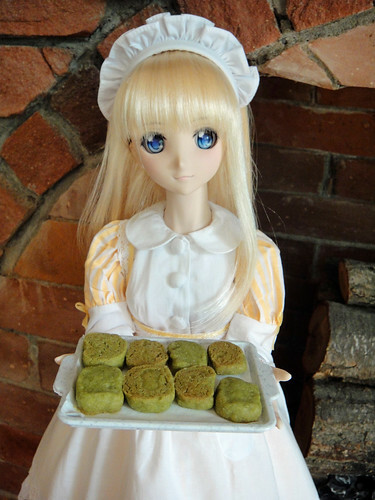 They look sooooooooo real and yummy!!!!!!!!!! ^_^ I want to eat them soooooooo much!!! !